Home Costs > How Much Does Farm Fencing Cost? How Much Does Farm Fencing Cost? Farm fencing is used to secure your farm and to ensure that the livestock will not be harmed by the fence itself or escape from the area. Choosing the most appropriate fencing type depends on the type of animal on the farm that needs to be secured and the terrain of the area. The total cost may also vary depending on the quality of the materials you choose, as well as the total perimeter. The fencing is often said to be one of the most expensive parts of livestock grazing. 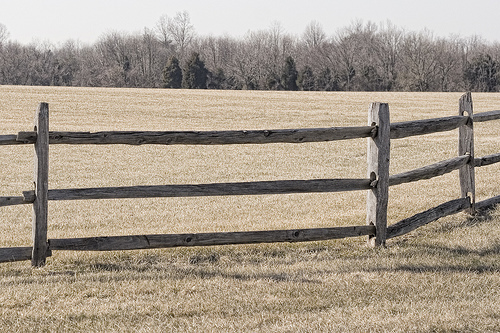 Depending on the type of fencing and length you choose, the cost for farm fencing greatly varies. Fencing, regardless of which route you go, will cost anywhere from $0.75 to $3 per foot. The fencing type will depend on your purpose, type of soil, the terrain, weather, safety, the availability of power and visual impact. Vinyl three or four rail fencing can cost $7 to $10 per foot installed. Chain link fencing can cost $5 to $8.50 per foot installed. Woven wire fencing, for example, can cost $1.75 to $3 per foot installed. 4 to 10 strand smooth wire can cost $0.75 to $2 per foot, and this will depend on the number of wires needed. A 10 strand will be good enough to contain all large livestock. Barbed wire fence, on the other hand, can cost $1.50 to $3.75 per foot installed. A wood rail or post fence, as pictured above, can cost $8 to $11 per foot installed. A jackleg, or commonly referred to as a buck fence, can cost $2 to $4 per foot. This fence is ideal for areas where it’s hard to dig. A high-tensile non-electric fence can cost about $1 to $2 per foot, while an electric wire fence can cost $0.75 to $1.75 per foot. Prefabricated panels, which come as two-inch tubing panels, will cost about $50 to $70 per 12 feet, not including the gate. Each gate will cost $70 to $125. 16-foot cattle and hog panels can cost $14 to $18 per 16 feet. Like a puzzle, this fencing type can create different combinations and is known to be very durable. Rail fencing will be used as a border fence and are popular on horse farms where animals need to be confined. Rail fences can be made from PVC plastic, treated wood or painted wood. Plastic won’t be as strong as wood, but it’s going to cost more because they are more attractive and won’t require any painting. These fences tend to be four or five feet tall. Woven wire fencing will use two 8-inch diameter posts with a 4-inch diameter cross brace at the ends. This fencing can come in various heights and spacing, and this will all depend on your livestock size and how many animals you have per acre. Common spacing will be between six to 12 inches and the height will be 26 to 48 inches; this will depend on the jumping ability of the animal. Between these braces will be a steel “T” post alternated with 4-inch pressure treated wood posts. All of the posts will be spaced about 12 feet apart and a strand of barbed wire will be at the top. Barbed wire fences will be very similar to the woven wire but instead of one strand of wire, it will have up to five strands of 12-gauge wire. The strands depend on how many animals you have per acre. There will be two types of barbed wire fences: standard and suspension. Standard fences will usually have posts spread about 10 feet apart with three to five strands, while a suspension barbed wire fence will have up to six strands of barbed wire. Each strand will be stretched so no more than three inches sag between the posts. These wires will be held together by posts spaced 10 to 12 feet apart if using a fiberglass post or about 50 feet apart if using a line post. Another difference with the suspension of barbed wire is that it will sway in the wind, preventing animals from coming nearing it. High-tensile wire fencing can either be electric or non-electric. This fence will have eight strands of high-tensile wire on 4-inch in diameter wood posts which are spaced 20 or 30 feet apart. If it’s electrified, it will use five strands of wire and three will be charged and the other two will be grounded. Each post will be eight inches in diameter and will be spaced 25 feet apart. Electrified fencing can be charged using a regular outlet or a solar energizer. Mesh wire fences will be stronger than most options and are designed to confine small crop areas or feedlots. They will have small openings and no exposed sharp wires to cut an animal. Annual maintenance costs need to be factored in such as replacing worn-out wires or replacing an electric/solar energizer. Oftentimes, adding a gate won’t be included in the fencing costs. Wood fences may have to be painted or stained after install. Fencing will be on your personal preferences, but as a rule of thumb, most fencing is adequate enough to contain sheep, while a high-tensile electrified fence will be ideal for sheep. For hogs, it’s recommended you use woven wire. Every state and city will have its own laws when it comes to any sort of fencing. These rules can include how far the fence posts need to be apart and/or how wide the boards can be. Check with your local codes to see what’s legal. Woven wire fencing is ideal for those who want to keep pests and predators off their land. Posts should be as deep as the height of the top wire. Beefmagazine.com says you should watch the post spacing. Many farmers tend to use too many posts, and depending on the fencing you use, an electric fence should have a post every 80 feet or a post for every rod length, which is 16.5 feet. If using an energizer, make sure it’s powerful enough. Experts recommend at least one joule of output per mile, regardless of how many wire strands you have. Also, pay close attention to the grounding since this makes up 99 percent of the fence. If the ground rod is too close together, they may interact with each other, acting as one. To prevent shortages, consider plastic or composite posts instead of steel. Tractor Supply Plus says five strands of wire is recommended if you’re installed a barbed wire fence. A good fence should last 25 to 50 years. Talk with at least three to five fencing companies to see what they charge and what they can do for your land. HomeAdvisor.com can do the dirty work for you and send quotes directly to your e-mail. Most companies will be more than happy to come to your property for a free consultation. Some may even be able to give you a ballpark over the phone by looking at satellite images of your home.